Achieved an average 11% reply rate with a guest posting campaign in the pets niche. Secured 7 guest posts in 13 days and established a working relationship with a few of these bloggers. Secured a FREE link from a DR 73, 135K organic traffic/month authority domain. How many campaigns did you launch to achieve this goal? What was your reply rate? 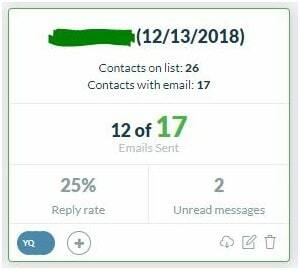 How many emails did you send and how many positive responses did you get?I’m pretty new to blogger outreach on this scale (I’ve done ultra-custom outreach campaigns for about a year prio) so I’m not sure if I did this campaign in the most efficient way. Nevertheless, I think I over delivered thanks to NinjaOutreach and a well-drafted email script and follow up sequence.What I did was run small daily campaigns, sending about 10-20 emails/day. All in all I sent 140 emails in a span of 13 days with a reply rate of about 11%. If I look at the daily reply rates I got anywhere between 6% to 28%. That’s about 16 responses, a few of which are sponsored post opportunities which I passed up for now. So I’m pretty excited to utilize all of NinjaOutreach’s features – if my success rate is already this good while just using maybe 50-60% of the tool’s features, what more if I can use it all?What other tools (if any) did you use for this campaign and why?I use Hunter.io to supplement my search for email addresses (the free version works fine!). NinjaOutreach’s chrome extension is actually pretty good already for finding email addresses, but combining it with Hunter.io makes prospecting so much easier.Additionally, I use Ahrefs to check if the site has at least 1,000 organic traffic per month. My reasoning for this is if a site is getting some Google love (in the form of organic traffic), then it must be doing something good. Therefore, earning a link from that site must be beneficial to my campaign.Lastly, I’m using Link Research Tools’ Power*Trust chrome extension. 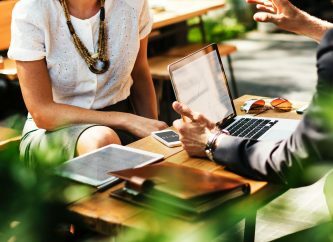 Basically it’s a tool that aggregates metrics from Moz, Majestic, and Ahrefs, among other tools, so I believe it’s one of the more accurate tools out there. You can learn more about the tool here.How did you use NinjaOutreach?I use NinjaOutreach mainly as an email broadcast tool. 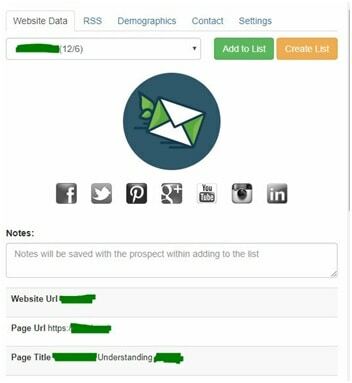 I haven’t gotten around to using its prospecting feature but I plan to play with it in the future.Currently we do all prospecting using Google’s search function then record all relevant data on a Google Sheet.After that I add all qualified prospects on NinjaOutreach via the Chrome Extension. 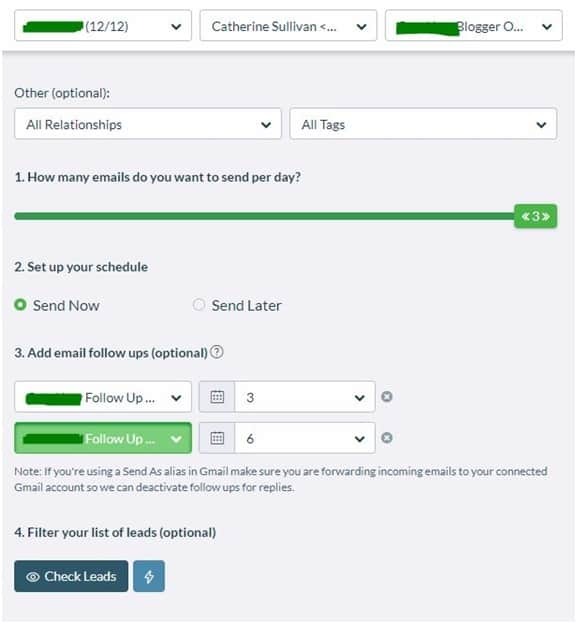 Once I added about 10-20 contacts, I kick start the campaign on the Ninja Outreach dashboard.The tool also lets you send two follow up emails which makes the campaign truly set-and-forget. I usually set my follow up emails 3 and 6 days after getting no replies. I spend a good amount of time making sure the contact names and email addresses are correct. I’m a bit paranoid so I check each email if the placeholders have been properly replaced with the correct names.In terms of customizing and automating my workflow, I found a good compromise. While I use a general email template, NinjaOutreach allows for some customization. For example, changing Page URLs or First Names per email.What outreach strategies did you find worked best? (best template, best approach, best schedule to send outreach, etc)There’s no one-size-fits-all strategy in outreach. Everything depends on your target website and industry.Are you looking to land guest posts on law-related websites? 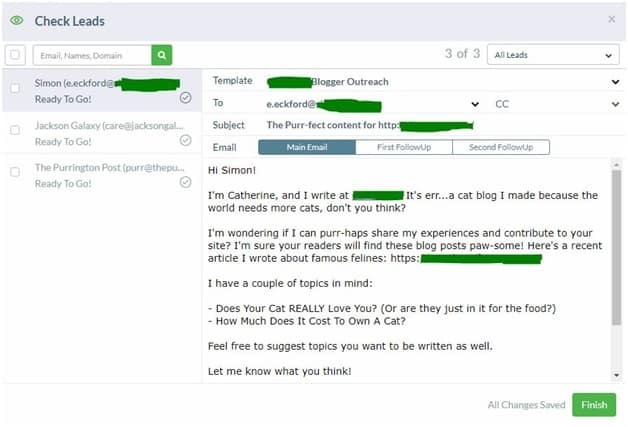 Your email should probably sound professional.In my case, I’m targeting pet blogs, so I tried to be as casual, as friendly, and as pun-ny as I could. Yes – the best template I had for this particular niche is littered (no pun intended), with puns. As I’ve already mentioned, this helped me land 7 guest post opportunities in 13 days, one of which is a DR 78 blog that gets around 135,000 monthly organic traffic. If you’re like me who keeps his ears to the ground regarding link prices, links like these sell for $280-$300 a pop: From here, all I really need to do was add more prospects and let NinjaOutreach do the rest. 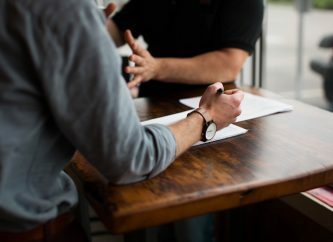 I won’t be able to do this if it wasn’t for the tool saving me a lot of time.What problem did NinjaOutreach solve for you, or how was NinjaOutreach specifically able to help with your campaign?I’m the owner of Outreach Worthy, a marketing agency with a big focus on blogger outreach. While we’re growing at an incredible rate, we’re still a small team so I’m always multitasking.NinjaOutreach really helped me save a lot of time by automating 80% of the outreach process.I really love the template builder and campaign set up function – it doesn’t even take 10 clicks (I’ve counted!) to get the ball rolling on one campaign. Before, I used Gmail’s canned template feature to send emails and if you’ve done manual outreach before, you know how tedious and time-consuming replacing names and websites URLs, and copy-pasting subject lines every single time is.With your tool, I get to send 15-20 emails in about an hour and a half. This time already includes prospecting, so the actual time it takes to send emails might just be 10-15 minutes. This would have taken twice or thrice the time if I did it manually.Before NinjaOutreach, what was your process for prospecting and launching your campaigns?Prospecting has been pretty much the same for us – we’re still using advanced search operators and checking metrics via Ahrefs and LRT. The biggest change is in the efficiency of how we send emails and follow ups. NinjaOutreach made these two tasks automated (I absolutely love having two automated follow ups), so we now have more time qualifying leads and making sure they’re a right fit for our campaigns.What process would you say was more cost-effective? Why?NinjaOutreach’s template builder and automated campaign feature already reduced the time spent on one campaign by 50%. As the saying goes, time is money, and I’m saving a heck of a lot of cash by using your tool.I’ve used BuzzStream in the past for a short while, but it felt more like a glorified canned email. Suffice to say that NinjaOutreach has surpassed my expectations. While the tool may have a few bugs here and there, their tech support is really helpful. One of them is a fellow Filipino, so he’s been extra helpful to me. 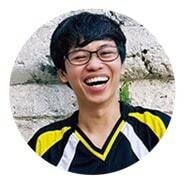 Shoutout to Harold for being the best CSR for NinjaOutreach!